The official online shop of the Music Information Centre Lithuania offers a broad selection of sheet music publications and CD releases by Lithuanian composers. For the time being, it only sells physical sheet music publications and hard copies of CDs. But we believe that in the nearest future we will be able to provide the possibility of purchasing digital albums, single tracks and digital sheet music copies of individual musical pieces. Taking into account the specific structure and functions of our database, we decided to implement an integrated mechanism of e-commerce. For this reason you will not find a separate eShop section on our website. To order our publications you may click on the shopping-cart icon or press “Order” button in several sections of our database. The majority of these may be found in the “Classical/Contemporary” music section, except but a few publications available for purchase in the “Jazz” and “Electronic/Experimental” music sections. using the Find works function in the header of our website. For our online music shop we use the services of Braintree, a Chicago-based international web payments company and a subsidiary of PayPal, currently providing its services to more than150 million global active consumers. making payments through the PayPal system. After selecting the item(s), you have to fill in an order form. This order form will request personal data and payment information for the purpose of processing the order(s). For payment by credit card, you must enter the credit card number, the expiration date and the card verification value number CVV (a three-digit code printed on the signature panel on the back side of your card). 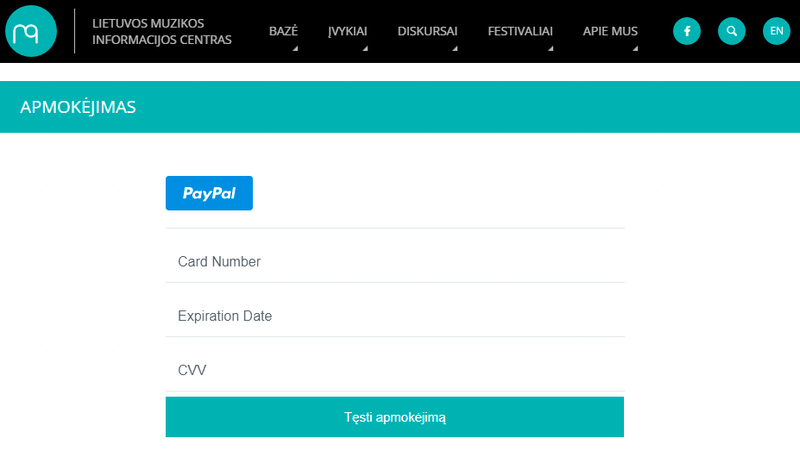 For shipping goods purchased directly from us we use the services of AB Lietuvos paštas (Lithuanian Postal Services) and calculate shipping costs according to their current postage rates. Your final shipping charge will be calculated depending on the total weight of your purchase and zone of your delivery address (e. g. domestic, European Union, the rest of the world).